Preserve the Pig. Preserve the Man. So much of my chat with folklorist Barry Ancelet feels like unraveling strings of history coiled around nostalgia. He takes long pauses as he scrolls through pictures of a pig roast populated with grandchildren, godchildren, friends’ children, nieces and nephews. A cracked grin fills the silence. We’re talking about boucherie, the arcane Cajun art of communal butchering, a subject that Ancelet has both studied and lived. It strikes me that Ancelet is in-between worlds, at once giddily fascinated by the phenomenon and blissfully immersed in it—a subject of his own study. Somehow, Ancelet is both the observer and the observed. 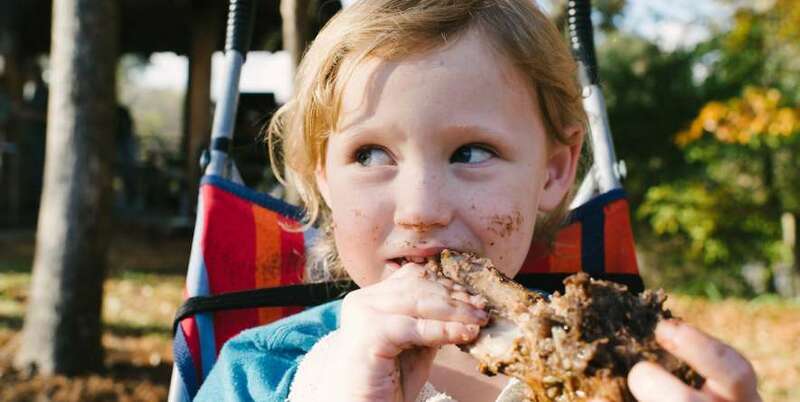 You see the academic self-consciousness dissipate when he catches sight of a photo of a child eating a plate of pork and fixin’s. Here, he is his earnest self, bucking the tittering of his intellect. And in these moments, he’s an open book. 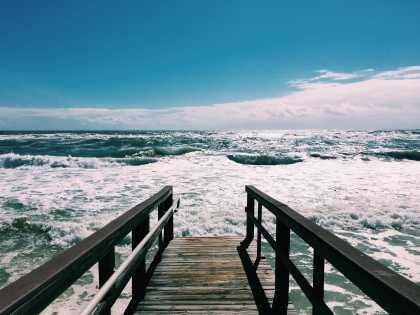 As we talk, he cycles through dozens of photos on a paper-thin aluminum laptop, his hide-tanned fingers flicking the mouse pad through a shellac of memories, the yellowed vintage of the photos scanned and preserved. Ancelet is speaking from experience here. His family held boucheries well into the early 1970s as a matter of utility, gathering nearby Cormiers and Menards each December to lend a hand and take home a share of the hog. 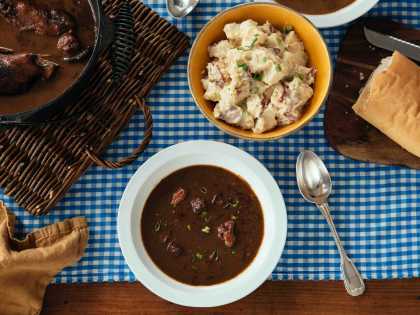 Thanks to refrigeration, they didn’t have to commit to eating immediately all of the rendered foods, like generations of Acadian families had before them. So much of the history of good food developed as a prologue to the age of refrigeration. Before you could stash perishables in a block of ice and expect them to remain edible for months, country folk devised all kinds of ways to make sure their crops, both plant and animal, could be consumed efficiently and last through fallow months. Boucherie is just one such example, and not necessarily unique to Acadian foodways. Not to be confused with other popular porcine celebrations in Louisiana cuisine—such as the suckling pig roast known as cochon de lait—boucherie is not itself a feast but a cooperative form of food processing that has yielded an entire culinary tradition still seen in Acadiana’s boudin and cracklin shops, rural Cajun smoke-houses and esoteric delicacies like ponce (a.k.a. chaudin) or fraisseurs. That’s another chapter in itself. Typically, one of a handful of families would contribute a pig to slaughter, each group taking turns to put up a hog of suitable size that was neither too big nor too small. All of the participating families sent representatives on the weekly-appointed boucherie day, each taking a station for breaking the hog down into a variety of meat products — most preserved, but some consumed on site. 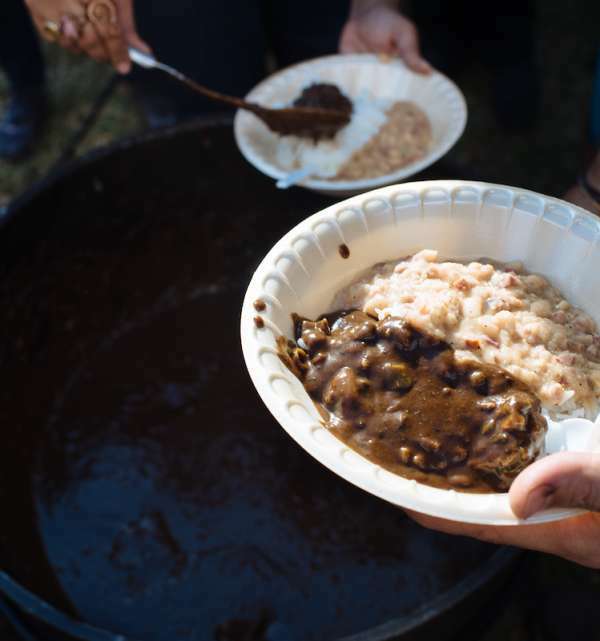 To that end, boucherie was a rotating series of chores for a small trust of families, not unlike the Monday laundry days that traditionally served as a time to make red beans and rice. The bounty of boucherie was and continues to be manifold. The systematic butchering sent legs and intestinal casings to sausage making, gelatins and face fats were cooked down with seasoning to make hog’s head cheese, stray minced meat was cut with rice to make boudin blanc and/or mixed with blood to make boudin noir and the skin was simmered into lard to create a confit-like preserving fat in which to store other cuts of meat. At the end of a long day of scraping, peeling, chopping, stirring, stuffing and smoking, the participants gathered around a pot of backbone stew, slowly coaxing marrow and tasty morsels from the spine. The list of foods goes on and varies from region to region. Only the dishes adaptable to modern palates and conveniences survived beyond their necessity. When you have a seemingly never-ending supply of pork loin, there’s not a lot of reason to boil ears. None of this, Ancelet points out, was unique to the country folk of Acadiana. Most of these techniques and inclinations can be seen in a variety of European and North African culinary traditions. Boudin blanc, for instance, can draw its lineage directly to old world France, where farmers pounded chicken or veal to be stuffed into intestinal casings. Charcuterie and sausage-making stem from precisely the same utilitarian skill-set and abound culinary traditions in Italy, Spain and Germany. Acadians likely learned to smoke meat from Native American tribes or from colonial French contact with North Africans. Regardless of origin, they put those techniques on display in smokehouses called boucanieres, where they hung smoked links of andouille sausage or heavily spiced hams called tasso. The need to make exhaustive use of livestock protein is emblematic of the Louisiana frontier’s rugged conditions. With so much ready access to produce and interstates, it’s easy to forget that it wasn’t that long ago that the wetland we call home made inter-communal travel virtually impossible. Folks around here were geographically detached from the modernizing world. Even as the Tennessee Valley Authority and the Rural Electric Administration began electrifying the rural South, rural Cajuns still gathered around cauldrons of molten pork fat, making soap out of bones and speaking a language that had severed ties with its mother vernacular hundreds of years before. That same insulated distance from mid-century modernization made the Louisiana boucherie more resilient to the conveniences of refrigerated trucks, vacuum sealed packaging or electric-powered cookery. Because of that, boucheries continued to play a contributive role in the dietary routines of rural Cajuns well into the 20th century. The material utility of boucherie lasted long enough that its usefulness as a social device and as a symbolic device caught up. The modern boucherie is now a celebration of heritage and a form of cultural reflection, rather than an engine of self-sufficiency. Ancelet speaks with academic respect for the ingenuity of the communal butchers, the abject trust involved in a rotating co-op and the rustic genius of the procedural efficiency. But the room gets heavier as we slip into talking about what boucheries mean to cultural survival. Perhaps most vitally, the boucherie served as a binding agent for Acadian society well past the expiration of their material necessity. It’s important to qualify “necessity” in this case because, as Ancelet would argue, boucherie is still necessary insofar as it preserves cultural interconnection. This is not a new development, but one that becomes all the more important as the electrified kitchen gives us less reason to be together. We shift gears a little bit, and he interrupts our exchange again to show me a picture of St. Martinville’s La Grand Boucherie, an extroverted and festive version of the simple routine created as part of the Acadian cultural awakening of the mid 1970s, an era that saw the first attempts to rescue Cajun folkways from the creeping homogeneity of the American mainstream. The photo can barely contain the throng of smiling faces eagerly gathered around a hog splayed and ready for portioning. You can see immediately what’s important here, and it’s not the generous pounds of soon-to-be boudin. They’re preserving something else entirely. Toby Rodriguez circles the shoulders on a diagram of a splayed hog crudely scrawled into his notebook at an overhead vantage. He flicks his pen to either side of the page, indicating the hypothetical destinations of each quadrant of hog meat — one to boudin, the other to sausage. Maybe both to boudin, he says. Really, the sky’s the limit when you know the whole thing is going to be eaten in a single day. He chuckles to himself about the luxury of pork shoulder boudin, yet another one of those things that his Lache Pas team of cooks and preservationists do that the old timers may not appreciate. There’s a lot about a Lache Pas boucherie that might make the old timers shake their heads. Rodriguez and his partner, Bryan Kyzar, have been known to burn sage around the hog before shooting it. From the outside, wafting a holocaust of herbs in the air resembles a pagan ritual when paired with animal sacrifice, but Rodriguez says the whole point is to mellow the pig before slaughter. 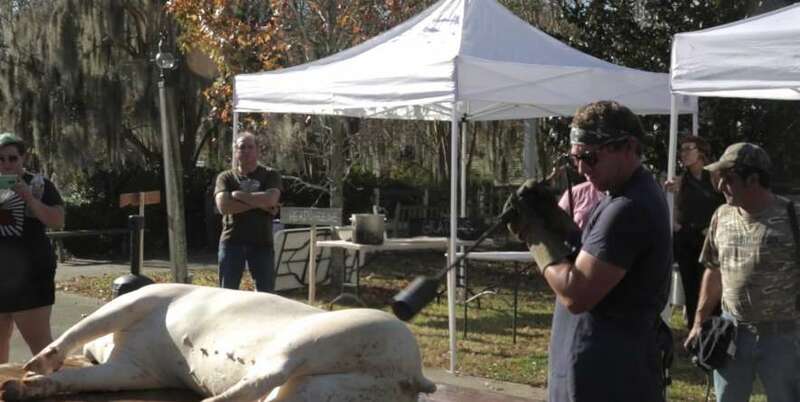 Once felled by gunshot, they slide the hog onto a pallet of plywood, employing six cooks or volunteers to hoist the dead weight onto what is best described as part gurney and part butcher’s table. Attendees follow the procession from the killing site to the cooking tents like mourners behind pallbearers. Rodriguez swears that it was never meant to be a funeral procession; it just sort of happened that way. “At first, it made me a little uncomfortable that people were becoming moved by what we were doing. I didn’t know how to receive it. People started referring to it as theater. And I thought, ‘It’s not theater, we’re not faking anything.’ But then I realized that it’s living theater. It’s meant to evoke emotion. If you want someone to retain information, make them vulnerable,” he says. I believe him. He takes the business seriously. Like many other neo-bouchiers, Rodriguez inherited the technique by way of a farm-raised upbringing in Poché Bridge, La. Back then, Rodriguez’s family killed and butchered animals they knew and named in a life-and-death cycle from which most modern carnivores are completely removed. For us, it’s anathema to believe that you could love and respect something that you ultimately saw as a source of nutrition; but for the vast majority of the history of animal husbandry, that’s how it worked. “We have no emotional attachment to our food sources. People used to have that. They were so much more conservative and reserved about what they did with their meat and how much meat that they ate." By returning intimacy to processing meat, Rodriguez’s vision of boucherie is one that combines drama, liturgy, visual art and ethical provocation. Even for progressive eaters, the concept can seem dauntingly radical. Farm-to-table is one thing, but it’s entirely another when you bring the table to the farm and face the life before the death that comes before dinner. Consider that you demand that sacrifice for your enjoyment and not your survival, and that reality can be chilling. But survival is exactly what Lache Pas aims for. It’s the very definition of the name of Rodriguez’s business, which translates roughly to “don’t let go” or “don’t forget.” As a group of artists who moonlight as custodians of a materially obsolete tradition, Rodriguez’s crew has taken to traveling the country, spreading the gospel of boucherie, a message that has been easy to evangelize in the farm-to-table age. How fitting, then, that we’re talking in a Whole Foods Market where Rodriguez is hosting a cochon de lait in the parking lot. There’s irony to that, given his cynicism of even the most humane forms of commercial butchering. Most people, Rodriguez says, think meat comes from a Styrofoam package. 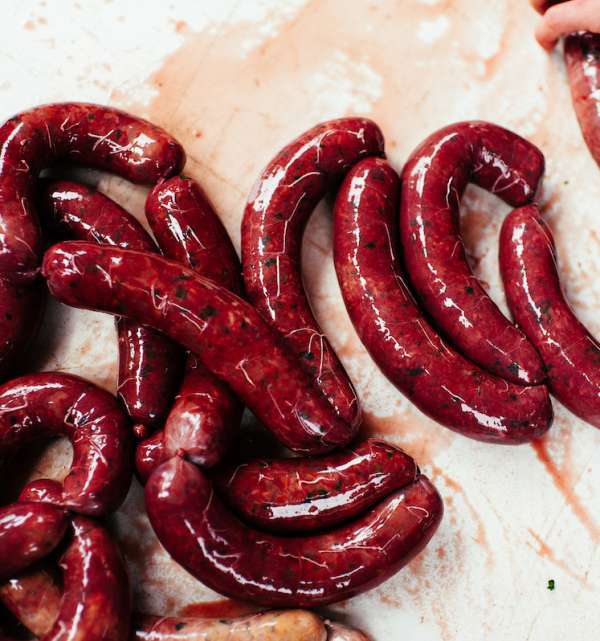 The brutal resonance of Lache Pas’s work begins with the draining of a hog’s blood to make boudin noir, an ancestral variation of today’s mainstream rice and pork shoulder boudin that you’ll find around Acadiana. Moments after the fatal gunshot, Rodriguez splits the hog’s throat with a 12-inch blade, directing blood into a bucket beneath it. 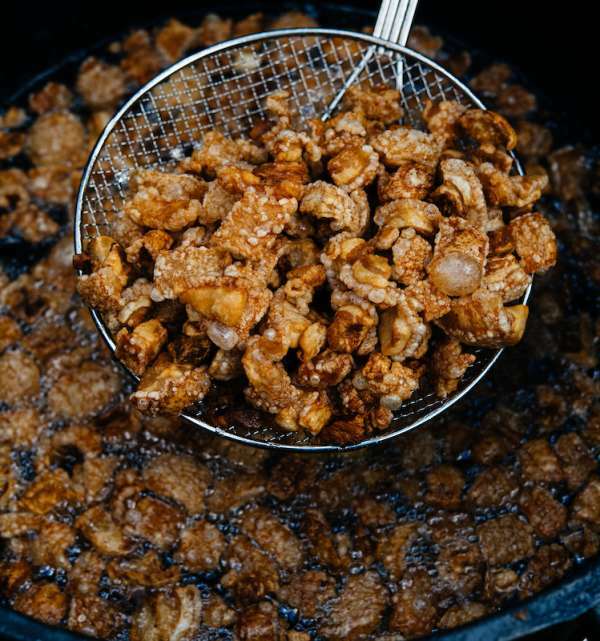 He adds salt to preserve the correct viscosity and prepares it to be stuffed into casings made of the hog’s intestines. Too little, and it’s runny. Too much, and it’s blood soufflé. The product is rich and ferric to taste but stunning to behold with a robust blackened red unlike any sausage you’ve ever seen. This can all seem terribly grisly. Most of us eschew consuming blood unless it’s juice from a steak. Rodriguez harvests it alongside a slew of other hog parts considered trash by today’s standard butchering chart. The trotters join the hog’s head to be rendered for headcheese. The viscera make the aforementioned fraisseurs, an apocryphal organ stew that Rodriguez has revived as a main attraction at his events. Ribs are picked clean to buttress sausage- and boudin-making or sometimes thrown on the grill for a more familiar plate. Hams join the loins in ovens, and the spine makes backbone stew, the day’s hearty reward for the cooks and butchers. Every part of the pig will be rendered and consumed by a crowd of eager pilgrims, another aspect of the performance that Rodriguez admits contradicts the routine efficiency for which boucherie was developed. But confronting people with the brutal utility of a harvested animal becomes secondary to the need to protect a cultural heritage—the Acadian legacy of rugged durability. Only now, rendering lard preserves identity rather than a precious source of protein. “I do what I do because there was a need for preservation. This animal was once being killed to preserve meat; now it’s being used to preserve culture." 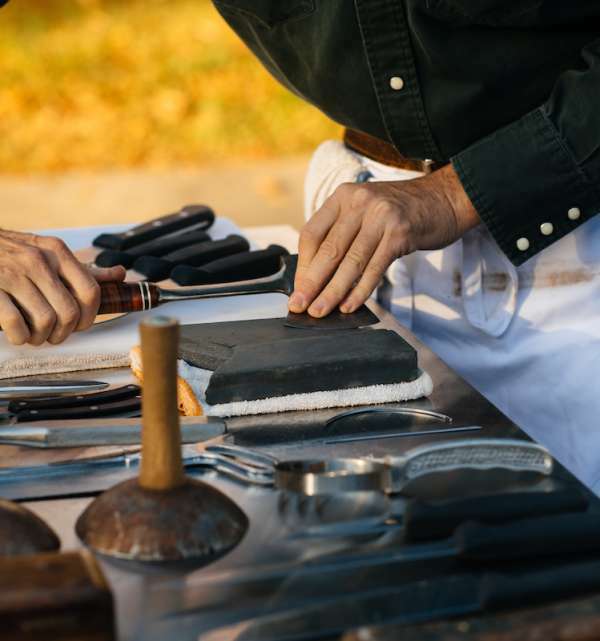 Rodriguez is not the only guy doing the preservation work. Since the 1970s, the old timers have kept the tradition alive as a reason to get together and to celebrate being Cajun in the manner of St. Martinville’s Grand Boucherie, all yarns and fiddles and re-enactment. But moving forward, folks like Rodriguez have re-established boucherie as something that can inform a contemporary culinary ethos. Today, Rodriguez’s use of the term “harvest” when referring to the process becomes more prescient. Making use of the whole hog is no different than the preciousness with which his grandmother treated watermelon rinds or corn cobs—stubborn but edible castaways in their own rights. She would boil the cobs to make corn soup or render the watermelon rinds into a jelly, fussing at the kids who’d only toss the rinds on the ground when they finished wolfing down the sweet and celebrated meat of the melon’s center. That’s another kind of boucherie, Rodriguez argues, and one that becomes infinitely applicable in a world with declining resources and multiplying refuse. Waste not; want not. Growing up, it was Manny Augello’s job to stir the lamb’s blood. Before moving to the United States from Sicily 20 years ago, he took over his mother’s childhood role at family celebrations, churning a ruddy bucket of blood to prevent clotting. The scene should sound familiar at this point. His grandfather would provide a lamb from his farm. His uncles would slaughter it and portion it, cooking the more substantive cuts for the holiday meal. Some parts were preserved for salumi, the Sicilian/Italian tradition of curing meats for preservation, and the rest would be consumed by a family that worked up a hunger from a day prepping an animal. Today, Augello is a chef applying that carnal and inherited know-how to the modern kitchen. Though he doesn’t really practice boucherie in the slaughter-prepare-and-eat kind of way, his restaurant in Lafayette is adorned with an abiding love for making whole use of the pig. Above his deli case hangs smoked andouille sausage, house-made boudin stuffed into genuine intestinal casings, Spanish chorizo, and guanciale (cured pork cheek). 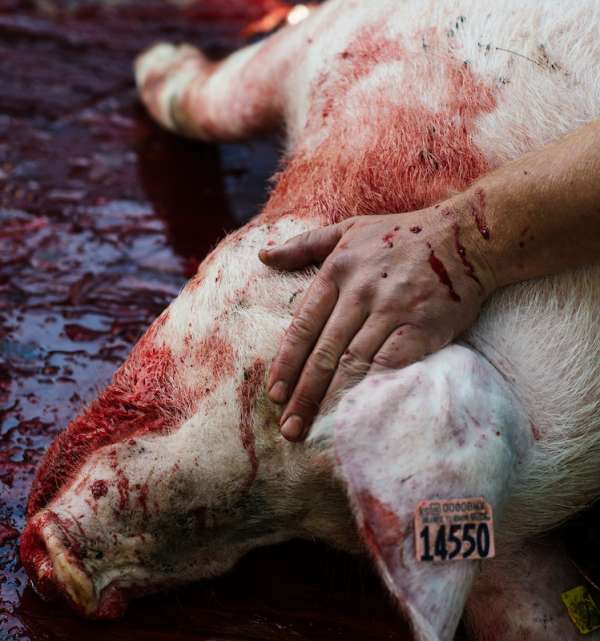 This is nose-to-tail cooking, the most obvious ethical descendent of peasant-style butchering. At once thoroughly Acadian, Augello’s work expands on the generative grammar of survival and culinary necessity that is universal to at least all European foodways, but most likely every cuisine in the world. That’s what attracted Augello to Lafayette from his American childhood near New Orleans, where his family owned a restaurant and had long strayed from Sicilian farm cooking customs. Cajuns still seemed to eat that way, Augello remarks. He laughs when he tells me about the first time he saw ponce, a variant of sausage that is stuffed inside of a pig’s stomach and smoked. The whole thing awoke a long dormant memory of his childhood, something that years of American convenience had suppressed into the distant regions of his mind. As far as I know, Augello is one of the only guys in town making ponce the old-fashioned way, fully embracing the rustic ham-fistedness of the process. You don’t really need a pig’s stomach to smoke sausage, especially the variation that’s affectionately called Cajun bologna for its use of mixed and minced meats, jalepeños and the occasional injection of yellow cheese. But Augello’s commitment to that methodology is his way of moving local cuisine forward by embracing the past full-bore. 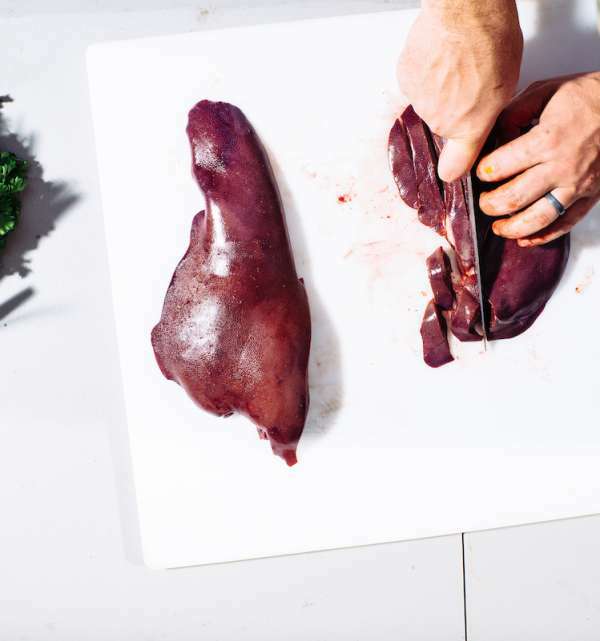 This approach goes for much of his cuisine, trading entirely on the nose-to-tail principle made popular by British chef Fergus Henderson, author of the seminal movement tome The Whole Beast. It’s from Henderson that, oddly enough, Augello developed his recipe for hog head cheese. By way of this British connection, Augello declined to use the mainstreamed cuts of pork that had become de rigeur in Acadiana head cheeses. Hog head cheese in Louisiana often is made from pork shoulder or loin when found at a restaurant or a specialty store rather than a boucherie. 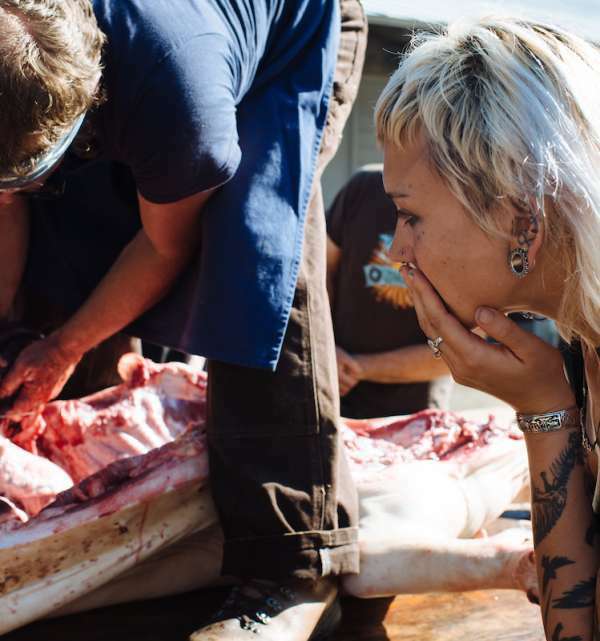 Adopting that nose-to-tail principle brought his version closer to the original purpose of hog head cheese, itself a pork product ubiquitous to Western cuisine, while simultaneously introducing technique and acumen. The result elevates the make-do recipe into a legitimate delicacy. You might call that an inversion. Augello calls that cooking. The reason you wouldn’t make the real deal is that demand for the real deal has drastically diminished. As we become more and more separated from the production of meat, we become more selective about what we’re willing to eat. The reasons are somewhat arbitrary. Why is it, exactly, that pork loin is more desirable than pork cheeks? The answers aren’t really clear—modern diners do prefer meat to fat—but likely come from an invasion of cultural mores into a hardier and less picky cuisine. 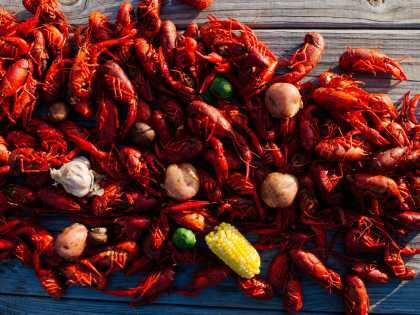 That’s a process that’s repeated over and over in Louisiana food culture, seen prominently with the lack of favor held for crawfish among the general population until the late 20th century. Many have attributed the historical diet-shaming of Acadian foodways to a bustling import of Texas and Oklahoma oilmen in midcentury, already inclined toward pity and contempt for the rural Cajun. Slowly but surely, those attitudes have begun to thaw. Celebrated Cajun foods like boudin and cracklin have never really gone out of style, but plenty of restaurants and specialty meat shops are beginning to reintroduce dish concepts long fallen out of favor. 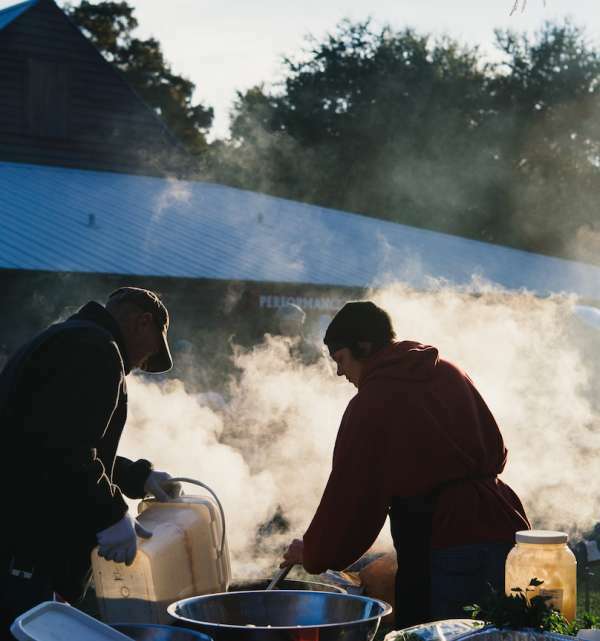 Chefs like Augello are applying intergenerational knowledge of how to fully utilize animal protein after gulfs of disinterest have separated Cajuns from once essential foodways. All of this can be immediately drawn to the sustaining influence of boucherie and its cross-cultural resonance with German, Italian, French and Spanish cuisines. Once nearly forgotten, boucherieas a methodology has begun to express itself once again as an ethical standard in the modern kitchen. What was old is new once again.